Drunken Spaghetti Meatballs – A childhood favorite, with an adult twist. 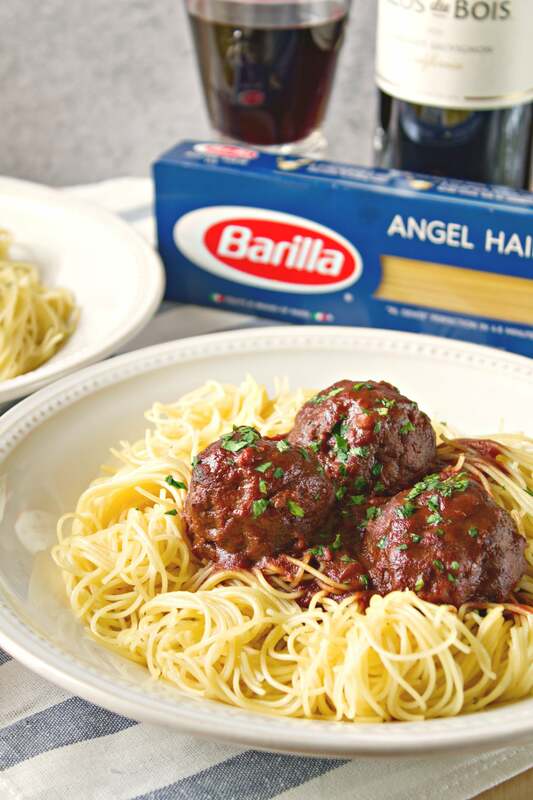 These meatballs are soaked in a rich, red wine gravy and pairs perfectly with Barilla Angel Hair pasta. Well, folks. Here we are: smack dab in the middle of the holiday season. And I am loving every second! Are you ready for the next couple months of food, family, holiday cheer, and more food?! I am sooooo ready. Especially for the food part. One of my favorite parts about this time of year: entertaining. Whether it’s big celebrations like Thanksgiving and Christmas or smaller get-togethers like Friendsgiving or Cookie Swaps, I love hosting people at our place to gorge on amazing food and sip on all the red wine we can handle. However, during this time of year, I tend to over-extend myself. I end up hosting so many events and get exhausted from all the cooking I have to do. Sometimes making roasts and turkeys can get draining, am I right?! Enter: pasta. When I think of pasta, I think of comforting, familiar meals that everyone enjoys. Plus, pasta dishes are the best meals for a crowd because you can easily make a lot of it for such an affordable price. Remember when I told you guys about my husband’s Christmas tradition with his family? They have 15-20 people over for dinner every year. To make it easier on them, they always make his mom’s famous spaghetti and meat sauce. Don’t you just love this tradition?! Sadly, there ain’t no way I can share that meat sauce recipe with ya’ll, for fear of excommunication from the family. Sorry, guys. But!!!! I do have a great new take on spaghetti that will satisfy the child in you and also the adult: Drunken Spaghetti & Meatballs. It’s like your favorite childhood spaghetti & meatballs, but the meatballs are cooked in a rich, red wine gravy, and hence, drunken. It’s not only crowd-pleasingly delicious but can serve up to 15 people (depending on how many meatballs per person)! For this dish, I decided to stray from the usual spaghetti pasta and went with angel hair pasta instead. Since the gravy is thinner than your traditional tomato sauce, it pairs better with the long, thin pasta that won’t dominate the gravy, but rather compliment it. When choosing your pasta, it’s important to go with a brand you trust. I’ve been a fan of Barilla pasta ever since I saw it used by the one-and-only Chef Giada Dilaurentiis on her Food Network show. If a born and raised Italian loves this pasta, then it’s gotta be the best. And it also hails straight from Italy! Once I tried it for myself, there was no denying the high-quality in this pasta, with the perfect texture and bite. Ever since then, it’s been the pasta brand I trust. Okay, now the sauce. Tomato sauce is great – you can’t beat a classic. But this red wine gravy is the tomato sauce of your dreams! The richness from the wine is perfectly paired with the beef broth to bring a flavor so intense you won’t be able to hold in your food moans after your first taste. Mmmmmm. And seriously, how could you go wrong with wine? Since wine is such a key ingredient to the sauce, you MUST pick a great wine that stands on its own. That’s why I love the Cabernet Sauvignon from Clos du Bois Wines. It has the perfect medium-bodied flavor that stands out in the sauce without overpowering it. Bonus tip: Make sure to pair the meal with the leftover wine. Since the same wine was used in the gravy, it is guaranteed to pair perfectly as an accompanying beverage. With the high-quality of Barilla pasta and well-balanced taste of Clos du Bois, your meal will be the talk of the table. You can learn more about this perfect pairing here. Read through the entire recipe before getting starting. This will make you aware of each step so you won’t miss anything while in the middle of cooking. You can cook the meatballs in the oven ahead of time and then just finish with the red wine gravy steps and pasta about 30-45 minutes before serving. Make sure to use slightly dry, day-old bread for the meatballs. If it’s not dry, toast it in the oven for a few minutes to get it to the right texture. The bread will work better in the meatballs if it’s dry. Once you’ve drained the cooked pasta, toss in a little olive oil (a teaspoon or two) to keep the pasta from sticking together. If the sauce looks thin after you’ve simmered for 12-15 minutes, don’t worry; it will thicken up once you add in the meatballs. I hope you love this recipe as much as I did! You can find additional recipe inspiration from Barilla here. Or follow them on Pinterest. What other pasta dishes do you love during the holidays? A childhood favorite, with an adult twist. These meatballs are soaked in a rich, red wine gravy and pairs perfectly with Barilla Angel Hair pasta. Preheat oven to 350 degrees. Grab sliced, day-old bread and place in a medium bowl. Add milk and completely submerge bread in the milk. Let sit for 10 minutes so that it can absorb the milk. Squeeze out milk from the bread. I find that a cheesecloth or sieve can really help this process. Discard milk. Using your fingers, rip apart bread into the smallest pieces that you can manage. Otherwise, you'll get big bites of bread in your meatballs. Place bread pieces in a large bowl. Add ground sirloin, beaten eggs, chopped onion, thyme, parsley, salt and pepper. Mix together with a spoon or with your hands until completely combined. Grab two large, rectangle baking dishes. You can use any baking dishes with sides. Just don't use baking sheets because the juice that comes out of the meatballs may spill over. Form 30 medium-sized meatballs and place in baking dishes (15 in each). Bake for 30 minutes. Once cooked, set aside to cool so they aren't steaming anymore. Before you start on the sauce, boil and salt water. Add Barilla Angel Hair pasta and cook until al dente, about 5 minutes. Drain pasta. Add back to pot and toss with some with olive oil so it doesn't stick together. Set aside. Place flour in a small bowl. Using tongs or a fork, roll 1 meatball in flour so that it is lightly coated. Tap off any excess flour. Repeat with remaining meatballs. Add butter and olive oil to large saute pan or braising dish and turn heat to medium-high. Once butter has melted and pan is hot, add meatballs (as many that will fit) to the pan so they can brown. About 1.5 minutes per side for a total of 3 minutes. I had to do this in two batches because my pan wasn't big enough. Remove from pan and set aside. Add wine and tomato paste to the pan. Whisk together and scrape off browned bits from bottom of the pan. Bring to a boil and continue boiling for 5 minutes until it starts thickening. Stir frequently. Add beef broth. Bring back to a boil and then reduce to a simmer. Simmer for 12 minutes. You may notice that it's not very thick. Don't worry, once you add the meatballs, it will thicken up. Add meatballs back to sauce. Stir around so they are all coated in sauce. Simmer for a few more minutes to heat up meatballs and thicken sauce. Add salt and pepper to taste. To serve, place 3 ounces of angel hair pasta in a plate and add three meatballs. Top with some additional sauce. Top with a little Parmesan and fresh parsley. Pour a glass of Clos du Bois Cabernet Sauvignon to enjoy with your meal. It will pair perfectly with this dish since we used it in the sauce! Haha great title! And the spaghetti looks perfect for dinner tonight! This looks so tasty, I mean how can you go wrong with a red wine sauce? Spaghetti and meatballs are my favorite meal and I love wine, so you know I have to try this recipe! Just looks incredible! Thanks so much! The wine is a game-changer! I love red wine sauces, and this looks amazing! Me too! Red wine sauces are so rich and flavorful! This looks perfect, Sharon! You’ve done it again. How delicious! One of my fave dishes! Man, these look amazing. I’m sorry for the drool on your post. I tried to use a napkin to wipe it off. Seriously, I am making these for our Sunday dinner. Yummo! Drunken meatballs…yes?! Wow. This looks incredible. Delicious looking meal! Who doesn’t love spaghetti with meatballs? Ahhh this looks so good!! There’s nothing better than Spaghetti! I did not know I needed red wine gravy until today. Can’t wait! Yes sir! Wine makes everything better! Caught my attention with drunken!!! Red wine in the sauce!!! Sounds perfect and delicious!! Thanks so much! Looooove the wine in the sauce! You had me at drunken.. haha. This looks delicious. Boy do I know about that overextending during the holidays? But this is a great recipe. I love barilla brand!! Haha drunken is the key word, after all. Thanks so much! I do love a wine-filled pasta sauce! How delicious!!!! This sounds wonderful — we don’t eat much pasta – but when we do… I like it with meatballs and if there’s not wine in the sauce, I’m drinking some on the side! Amen sister! Gotta have wine! We’re a Barilla family too! Come to think of it, I don’t think I’ve eaten any other kind – hmm! Your Drunken Meatballs look awesome – I haven’t had angel hair in such a long time! Adding it to grocery list now! Thanks so much! Yes, I really don’t eat angel hair enough either. So glad I could inspire you! You’ve paired up all my favorites in this recipe, and Clos du Bois rocks! This is perfect for family get togethers. My husband is the oldest of 8 so family father are packed! Yessss! This recipe is perfect for those get-togethers! Yum! Looks delicious! Love new recipes! Look forward to more! LOL! I thought that wine was going to be an ingredient in the pasta. But nothing like some delicious gravy to get you going. Great for a Friday night I would say. Sounds really good. Thanks so much! That gravy tho…It is seriously WOW! Looks like a delicious and cozy friday night meal!! Your blogs are so much fun to read. Love it! Wow. That recipe looks awesome. We may have to tweak some of that Christmas tradition….. Keep the spaghetti menu but introduce a new recipe. I don’t think there would be any arguments from the family. Certainly no excommunication! Aw, thanks Sandy! That’s so sweet of you to say! Yay! It’s so perfect for sharing with a crowd. Hope you love it!